I have been using my Nike FuelBand since the day I got it, about 81 days. While I do not expect everything to be perfect, I did run into an issue that should not have happened. Although I clearly achieved my FuelPoints for a certain day, I was not given credit for that day. Minor issue, no big deal, I know. But, I earned my points and should get credit for it. 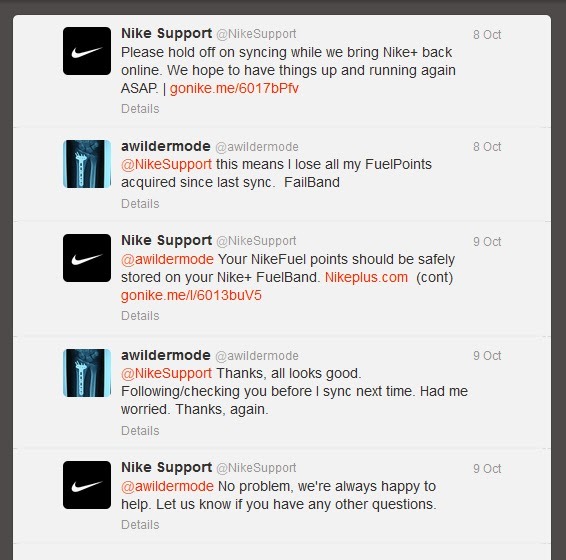 As I have mentioned, you can sync your data at the Nike+ site or via the Nike FuelBand App on your iOS device. 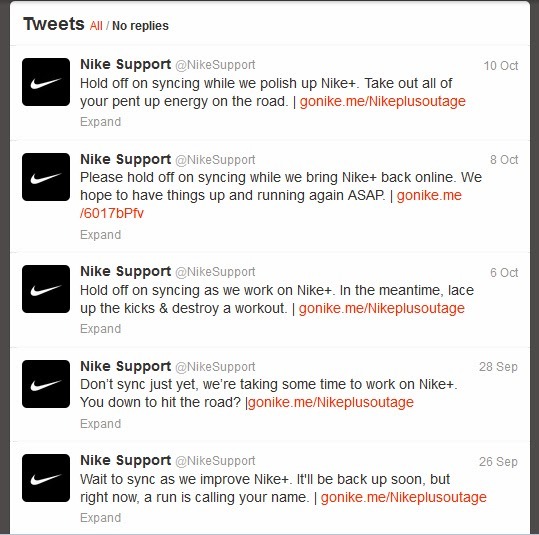 Nike does a great job of maintaining their Nike+ site, as they are constantly updating it...like every two days. Unfortunately, this means the site is down for a few hours and you are unable to do any updates. I have since learned that you can still sync the data on your FuelBand to your iOS device, just not to your account until the site is back up. I had syncing problems a few months back because of the maintenance and lost credit for that day. A few nights ago, I went to sync and I was encountered by the warning bar of death. Site was down. I had not synced up for about two weeks. I am doing some testing on battery life and memory capacity. Good news, battery can last over a week as I have yet to see the 'low battery' display on the FuelBand. Memory can last well over two weeks as I have yet to see the 'low memory' display. Bad news, I might lose any unsynced data, like before. That would be two weeks of FuelPoints, gone...puff, like Kaiser Soze. In a panic, I did what everyone does, I went to Google. 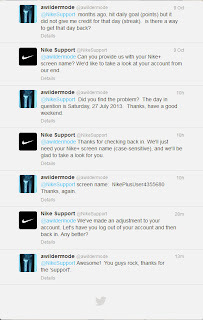 I found that Nike had a great customer support team on Twitter, @NikeSupport. They let you know when Nike+ is in its maintenance state...like how a bear will be in hibernation state. 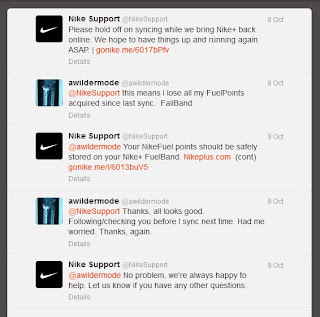 If you have a Nike FuelBand and a Twitter account, I highly recommend following @NikeSupport. 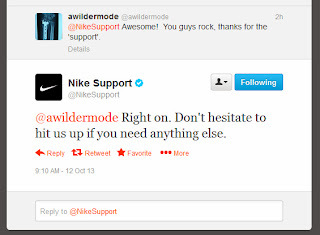 I noticed that Nike Support was quick to responding to others with problems and answered a lot of concerned tweets. I expressed concern of losing my data, and they wrote back within a few hours. Given the amount of responses a major company would get, I was impressed. 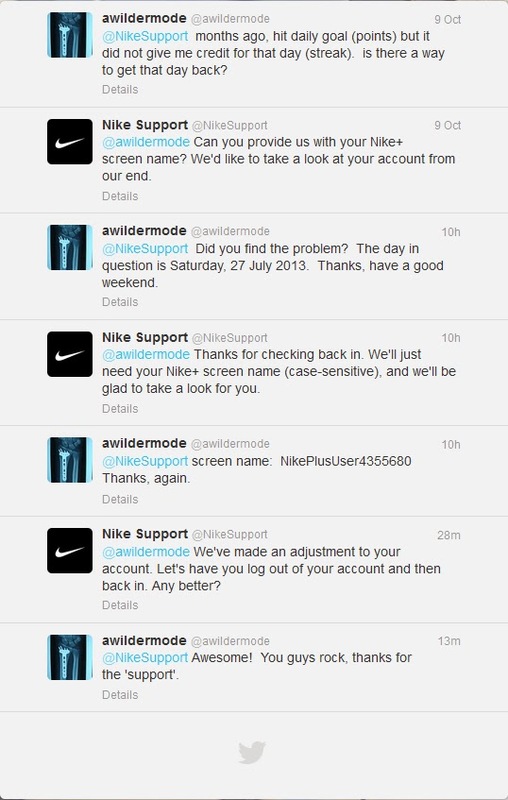 Why not have them fix the problem with my account? I stated my problem, at first there was a little miscommunication, as I am sure they are busy. They respond within minutes to questions and comments. Within a few hours, they fixed my account. I got the "We made an adjustment to your account", tweet at 7AM on a Saturday. A Saturday...at 7AM! I was barely up, just checking my social media...I know bad habit...and I get this tweet. Seven AM, this means they were there working on my account before the sun was up...on a Saturday. 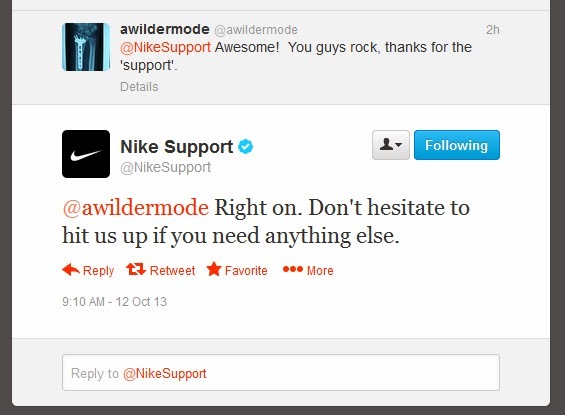 That is above and beyond customer service. Thank you Nike for fixing my first world problem. Update: Just got this tweet as a follow up.